Propeller immersion requirements as per the vessels loading manual must be complied with. Propeller immersion less that 100% will result in Loss of vessel Performance, Over speeding of the Main engine and Possible Stress or Damage to Machinery. Similar to the hull surface, propellers suffer degradation in performance due to surface roughness. The absolute magnitude of the reduction in ship efficiency due to propeller roughness is less than those experienced with a rough hull surface, but it still has been estimated that it could cause an increase of as much as 6 percent of total fuel consumption. Further, the efficiency loss per unit of affected area is greater, making the economics of cleaning and polishing the propeller very compelling. The effect will be greatest for propellers with large area aspect ratios and for propellers running at high rates of rotation. Polishing will mainly reduce the frictional loss of the propeller but will in many cases also reduce the rotational loss. On a propeller, physical surface roughness is created by corrosion (on both sides of the blades and heavier in the outer half region); cavitation erosion (concentrated near the tips and back of blade); and impingement attack (on the leading edge and closer to the tips). Improper maintenance can also increase roughness; this could be overspray from hull coatings, grinding/polishing that is too aggressive or nicked edges. There have been important advances in foul-release coatings for propeller blades made in the last 15 years. These new coatings can have better surface properties than the polished propeller surface. Even though they have evolved with very good adhesion properties, the coatings are subject to damage by cavitation erosion and leading edge impingement. The cause of the damage to the coating also prevents any fouling and so the localized coating damage does not affect performance to any significant degree. The propeller coatings also offer protection against corrosion-induced roughness and fouling. In service, regular underwater cleaning and reconditioning of the surface of a propeller is done with a small rotating disk that can easily conform to the complex shapes of the blades without gouging the surface. This tool removes all fouling and produces a fine surface scratch pattern in the range of 1 to 2 µm. This is similar to what would be expected of a newly manufactured blade surface. Any large deformation or damage, especially to the leading edges or tips, should also be repaired and smoothed out [ABS 2013]. 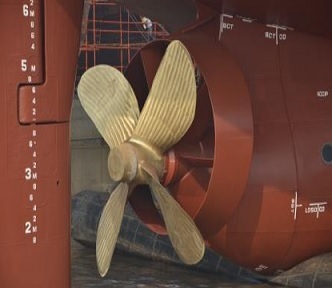 The importance of the propeller being clean with a polished smooth surface cannot be over emphasised as the efficiency of any propeller can fall off rapidly if it becomes pitted and covered in marine growth. If the propeller is constantly rotating, there should not be a problem with marine growth but if there is not sufficient cathodic protection or the propeller is allowed to operate close to the surface, then cavitation pitting can be caused as a major problem. Marine growth will tend to accumulate much more when the propeller is not moving such as when the vessel is in port or at anchor. Running the engine every day for a short period can reduce this build-up if this is possible with not so much excessive fuel use. Preventive maintenance can be taken by polishing and applying coating to the propeller to reduce the build-up of marine growth and regular in-water surveys to inspect the propeller for damaged, pitting and marine growth. It has been estimated that polishing a roughened propeller surface may result in a decrease in fuel consumption of up to 3%. Cleaning and polishing of the propeller can generally lead up to 6% improvement in fuel consumption. Divers can clean a 5 bladed and 10 m diameter propeller in about 3-4 hours for a cost of about US $3,000 in the Far East. In Europe the cost could be double as high. These numbers are quoted from ABS guidelines that are written in 2013, thus subject to inflation and market forces. What are the optimal timing for hull and propeller cleaning? What the best routine for cleaning to safeguard the integrity of existing paint system. What is the time to apply a new coating and which one? Measure/observe actual hull and propeller roughness/fouling and compare with baseline values that indicate when cleaning should be done. Use performance analysis packages that track changes in fuel consumption, shaft power and main engine power to identify degrading surface conditions. The first method is based on a direct assessment of the actual surface condition which must be done by divers in port. By correlating the roughness and degree of fouling to losses in efficiency and increases in fuel consumption, the owner can make an economic decision on when hull cleaning and/or propeller polishing should be done. For second method and a proper ship performance assessment, it is necessary to evaluate the speed power curve and for this purpose, the ship’s speed though the water without the effects of weather, tides or currents should be established. This is very difficult to calculate accurately, particularly on an actual voyage, as these environmental factors may vary significantly a bit over the duration of the voyage. In such a condition, the best option would be to conduct performance monitoring in the form of periodic speed trials over a set distance, in both direction and in calm water. However, this is not always possible and thus limits the use of analytical methods. The use of performance monitoring systems is attractive because it measures fuel consumption directly and while underway without the need for special arrangements in port. As stated, the impact of environmental condition on fuel consumption can be significant, thus it is necessary to isolate the effects of these parameters on fuel consumption. This is most reasonably done by collecting records of fuel consumption in controlled or at least repeatable voyage conditions. The data then has to be either normalized to remove effects of draft, trim, wind and waves, or compared with similar conditions in earlier tests. These approaches to performance monitoring have been in use for many years and there are quite a few vendors and products that endeavour to perform this function . Nevertheless, it remains difficult to use these methods to reliably discern the small gains or losses in efficiency due to light fouling that are now often the threshold for cleaning decisions. With these methods it is also not possible to separate the propeller condition from the hull condition. In summary, the use of performance monitoring tools is generally recommended along with accurate fuel consumption measurement techniques, but these should not be relied on exclusively to indicate when hull cleaning and propeller polishing are necessary. Thus, on a more practical aspect of condition monitoring, regular visual inspections that is supplemented by long-term records of coating types that has been applied, records of past roughness and fouling patterns. These added to performance data can be used to choose the best way to confidently maintain the condition of these critical surfaces. This is an all-inclusive approach to hull and propeller condition monitoring, as none of the above techniques on its own can provide the full answer to this important question. How to confirm stabilty condition ? How to maintain watertight integrity? How to navigate vessel safely in heavy seas ?